Tomahawk Historical Society - Did You Know? The Lake Ice fishing bear was born as a commercial by the Hamms Brewery Company in the 1950's. Originally, the fishing bear was utilized as an indoor plastic floor display by businesses promoting the sale of Hamms beer throughout the company's "Land of Sky Blue Waters" sales area. The originators never dreamed the display would actually go to sea. However, Leon and Florence Weizenicker, owners of the Lake Ice Company from 1948-1973, a local tackle shop and tourism business, saw an opportunity to call attention to their business by utilizing the bear as an outside exhibit. They had the bear fiber-glassed to withstand the rigors of the outdoors and mounted the display on an inner tube anchored just north of their property on Sawdy Pond, a small extention of the Wisconsin River. Since the fishing bear was in plain view of the adjacent State Highway 51 (present day business 51) and near the 4th street bridge leading north out of Tomahwk, the fishing bear quickly became a popular tourism attraction and photographic stop for motorists. 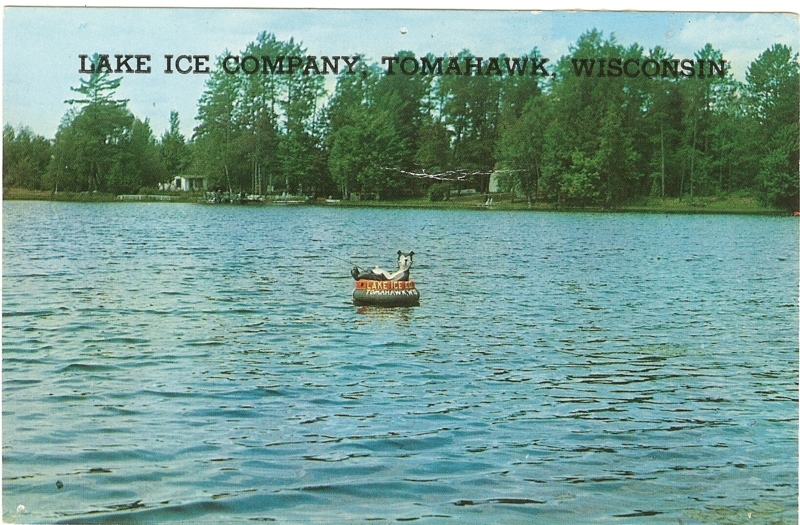 After the fishing bear was put afloat in the late 1950's and until the business was sold in 1973, the fishing bear was a well-known trademark of the Lake Ice Company. Subsequent owners of the business did not continue the fishing bear promotion. Ultimatley, the bear was rescued by Larry Tobin, owner of the Tomahawk Leader. In 1999, Larry donated the fishing bear to the Tomahwk Fishing Unlimited organization which is dedicated to fostering the fun and enjoyment of the sport of fishing, especially for the area youth. So once again, the fishing bear has attained instant recognition, in memory, as the original Hamms Beer/Lake Ice Landmark, and now as a mascot for Tomahawk Fishing Unlimited. Wisconsin is the only state that has assigned letters to its county trunk highway road system. All others use numbers exclusively.